Considered C. Emlen Urban’s signature design, the W.W. Griest Building was this noted Lancaster Architect’s first skyscraper. 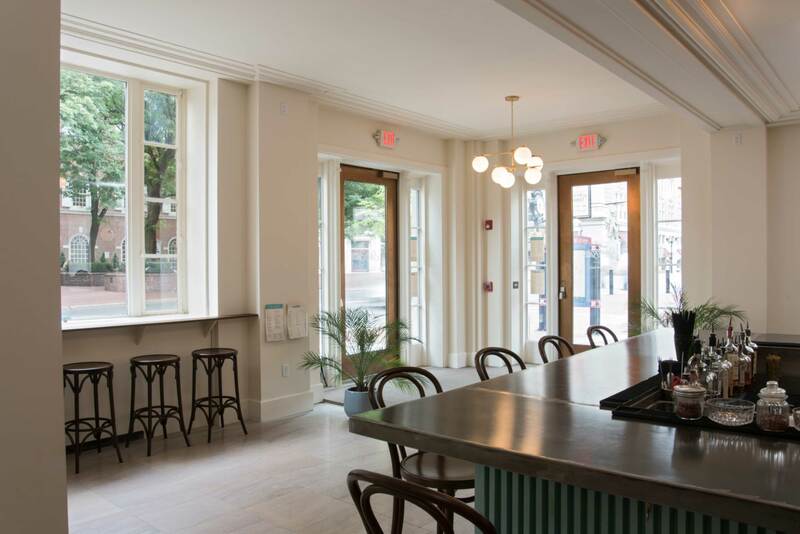 Sitting on Penn Square - the city’s most prominent location – this adaptive reuse transforms a vacant ground-level storefront into an inviting new watering hole and is one of the final pieces of the City Market District’s revitalization efforts. Built in 1924 and individually listed on the National Register of Historic Places, this 14-story high rise was named for the former head of Public Utilities and Pennsylvania Representative William Walton Griest. But in 2018, it isn’t just the historic terra cotta façade and Corinthian-topped embellishments that make this building special, but the celebration of the history in conjunction with the embrace of modern design speaks to the values of everyday Lancastrians; honoring our past and investing in our future. 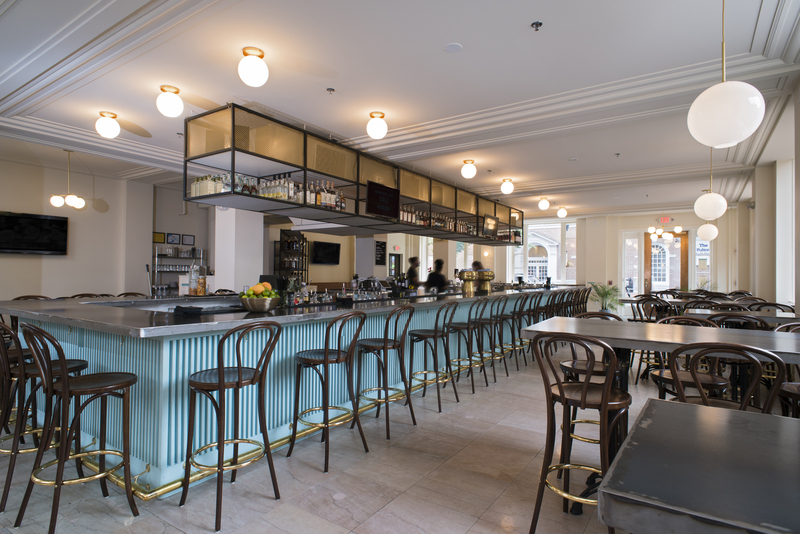 Shot & Bottle’s owners Kate & Andrew Martin understood the value of the historic charm of this space and invested in restoring its original character-defining features while adding modern accents that juxtapose with the original materials and design elements. 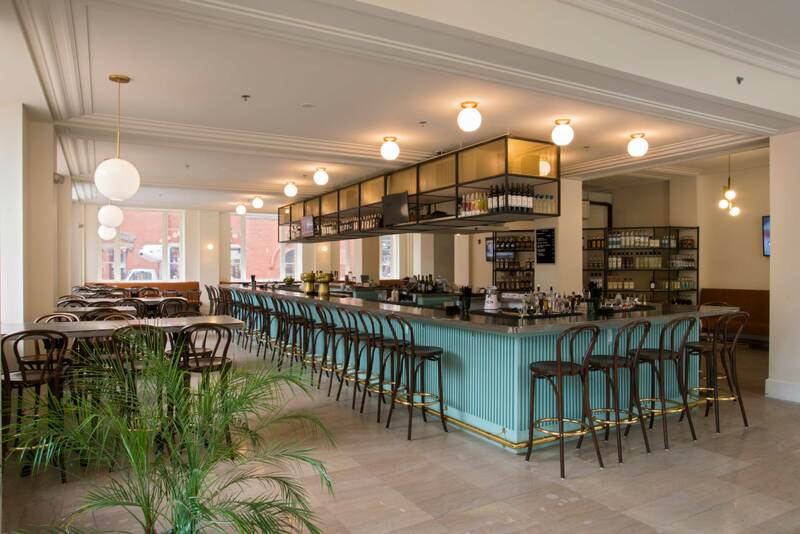 As part of the renovations, original marble flooring was restored along with the original ceiling and column plaster details indicative of the artisan driven building values of C. Emlen Urban’s time. However, the bright color palette, clean lines and open space simultaneously boasts the style of today while highlighting the beautiful details of yesterday. Hand-crafted steel display shelving, bar and table tops provide a modern industrial aesthetic and pay homage to the steel frame buildings erected during the early 20th century while hair pin chairs and ​simple, period globe lighting are familiar to the watering holes of yesterday. The architects also considered compatible use of this prime ground-floor real estate through the thoughtful design of fully accessible restrooms located in the basement. By relegating supporting services to the basement, the prime street level space remains open and unobstructed, allowing visitors to appreciate the character of this open plan historic space as well as views to the surrounding urban context. As a prospective post-Market brunch spot, happy hour spot and easily identified meeting place, building owners Ecklin Development’s priorities were to fill the underutilized space in the most traffic-heavy area of the City with a destination restaurant to compliment this high visibility location.The exterior architectural lighting and contrast of the granite exterior and the contemporary glass canopies designed by HAA gives one the appreciation of historic craftsmanship while expressing to the public the life still stirring inside this grand structure.